A very nice crowd of Serrans and spouses attended the retreat given by our Chaplain Monsignor Mullen at the Savior Pastoral Center. The theme was the Beatitudes from the Gospel of Matthew 5:3-12. The Runnin' Revs were victorious over the Serra All Stars 41-39 in an excitement-filled game at Bishop Miege field-house. 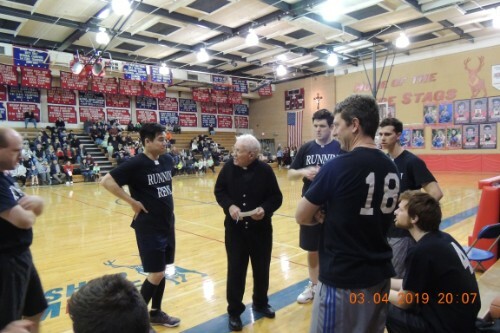 In this photo Coach Msgr. Michael Mullen shares some of his wisdom, gleaned from countless hours poring over scouting data, with his team of priests and seminarians from the archdiocese. The Ben and Betty Zarda 5th Grade Vocation Day Luncheon was held on March 5th at The Church of the Ascension school. There were 25 Serrans in attendance to help our co-ordinator, John Muehlberger, assemble and serve the luncheon. A total of 750 5th Graders from throughout the archdiocese attended this event. At the regular meeting on January 23rd, Msgr. Mullen inducted five new members into our club. Monsignor Mike Mullen Celebrated the Mass on February 13, 2019 at the Valentine Mass and dinner. Making it a family affair. Together these gentlemen represent families with a total of twelve generations helping the Sisters Servants of Mary by hosting the spaghetti dinner. The annual SOS Benefit Dinner was a great success. Held at Union Station on Friday, January 25th, the activity benefits seminarians from our Archdiocese, the Diocese of Kansas City-St. Joseph and Conception Seminary. Setup volunteers included eight members from our club. We were also well represented at the dinner. See the photos at the end of this article. The Serra Valentine Mass and Dinner will be held on Wednesday, February 13th at Milburn Country Club in Overland Park. Registration information is on the calendar page. Archbishop Naumann always attracts a large crowd of Serrans and this was no exception. Other honored guests included Fr. Scott Wallisch, archdiocesan co-director of seminarians, Fr. 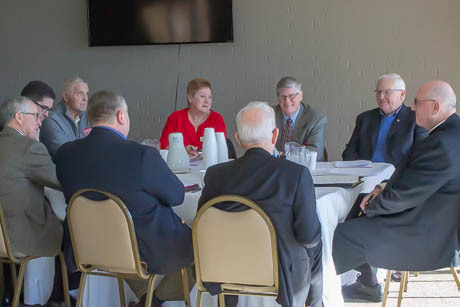 Dan Morris, archdiocesan vocations director, Jerry Malone, president of Johnson County Serra club, Nancy Gibson, past district governor and Matt Fassero, president of the Atchison Serra Club. Fr. Dan gave a brief update first. The archdiocese has seven men currently with applications to seminary. While it’s good to have that many, he cautioned us that they still have to go through the discernment process. The Archbishop’s Quo Vadis retreat will be held Dec. 21-23 for young men who are interested. Entitled “In Mercy Chosen” it will be lead by Fr. Bill Bruning.